Available Saturday, Sunday, and holidays when other special rates are not available. 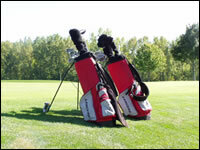 Carts are mandatory on weekends and holidays before 2:00 p.m.
Buy a Play Card. Pay for 10 (ten) 18 hole rounds. Play 12 for the price of 10. Valid drivers license required for deposit. Carts mandatory weekends and holidays before 2:00 p.m. from the second Saturday in May until the second Sunday in September. Individual $40.00 per half hour lesson.